I spent the morning pottering around town after my extended break to try and get over the lingering effects from Norovirus. I finally started to leave around 3pm, and after a bus ride I finally started walking 45 minutes later. It was that time around mid afternoon when the thunder was lashing the sky overhead, and I decided to walk along the valley for an hour or so before climbing into the hills. It was a pleasant walk on a lightly used road, but after 4 miles of it I was very happy to be back on trail and climbing again. The storm was still not over but I could see a glimmer of blue on the horizon and that gave me hope that the end was not to far away. The trail was rather busy, with people out on day hikes and rides and also Colorado Trail hikers heading south. But because of the rain none of us stopped to talk very long to each other. It did indeed feel rather freeing to be back hiking again. I don’t know what I will do when I finish up and have to go back to the real world. It will be one hell of an adjustment that I am not looking forward to! About 3/4 up the hill the rain stopped and the clouds cleared. It was absolutely perfect timing as I got to enjoy skirting along the ridgeline in peace and quiet. I spent most of the time on two thoughts, finishing hiking mentioned above and generating a plan for tomorrow. Tomorrow will be awesome. It is a 32 mile waterless stretch primarily because the trail never leaves the divide. 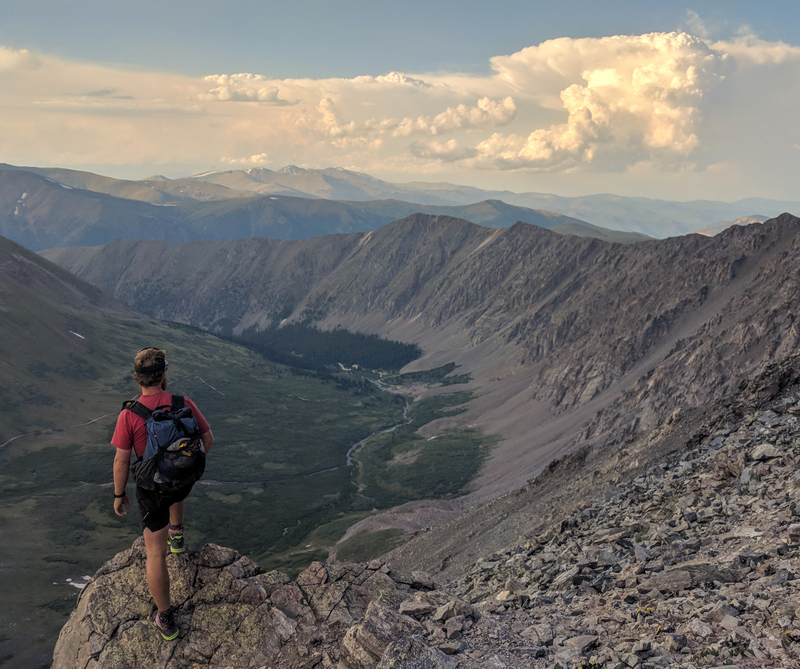 It is just running ridges for an entire day, and just to finish the day off i get to summit a 14,000ft (3,400m) mountain. Doesn’t that sound great? I want to get as close to the last water source as possible before calling it a night, so i ended up walking to just before dark before setting up camp.